I am pretty skeptical by nature. It's not a good thing, but it is what it is. It probably goes back to trust issues. Still working on those…always and forever, most likely. 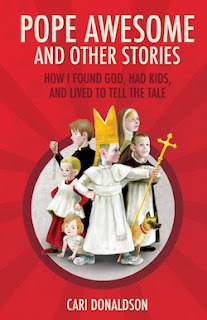 So when the latest book comes out from the newest Catholic writer on the block and everyone starts raving about how many times they LOL'd or how many passages they just had to read to their husband, in the back of my mind I tend to think, "Is it really as good as everyone is saying?" Because, let's be honest, we tend to be less critical of our friends (online friends count too) and we cheer and champion their success more than strangers. It's normal, I think, and something we can't really help, even if we wanted to. That being said, I can say as someone who doesn't know Cari Donaldson any more than anyone else who has read her blog for a relatively brief period of time or anyone who looks at her Instagram pictures, that this book is a truly well-written, enjoyable read! I really did find myself laughing out loud several times and read more than one passage annoyingly out loud to my husband. So, take it from this skeptical girl that when someone says that Pope Awesome and Other Stories is a great book, they really do mean it. I don't need to tell you what it's about because just about everyone else has done that much better then I can. It's more than just a memoir. So much more… It speaks to the reader on a higher level than a memoir or a collection of funny stories. What it speaks to you no doubt will be different than what it whispered to my heart. Give it a try… you won't be disappointed. I'm glad to read this endorsement. I love Cari's blog, but am always skeptical too when people go gaga over a new book. I will have to check it out! Charlotte, thank you so much for this review. I know exactly what you mean, about how knowing the author skews reviews a little softer of "critical", so I deeply appreciate your honesty. Glad you reviewed this! I have been seeing it about and wondering... I could use a good laugh in this stressful season!